I awakened in a Bishop hotel about 5am and headed toward North Lake which rests in the Sierra highlands above Bishop in the Aspendell area. The road to North Lake is a one lane, unpaved, uphill mountain road off of highway 168 which runs two miles to the lake. If your car is clean when you set out, it won’t be when you arrive. It was still dark when I arrived about 6am. So I sat in the car and enjoyed the onset of civil twilight. At this time I noted the many colorful aspens surrounding the parking lot. The best photos from this lake seem to involve a calm lake reflecting fall colors. Well, the lake was not calm on this cloudless morning, so my shots of the lake were a bust. 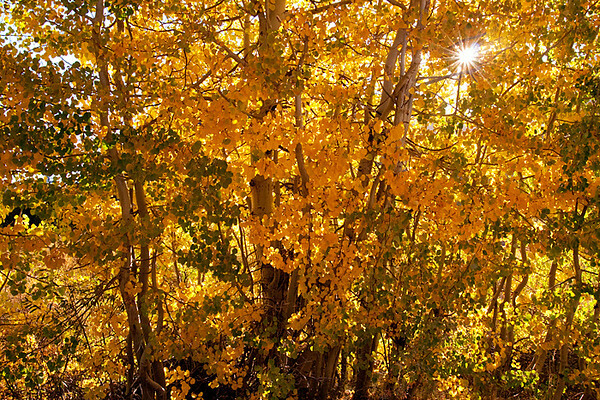 But when the sun cleared the canyon wall it backlit these Aspens quite nicely. I like the interplay of the complimentary fall colors here as the sun peeks through.